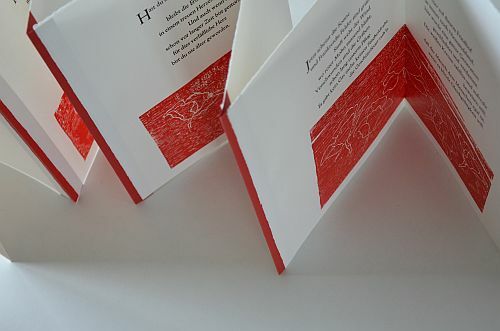 Since I have started making books, I have made small books and large ones, illustrated books and typographic ones. 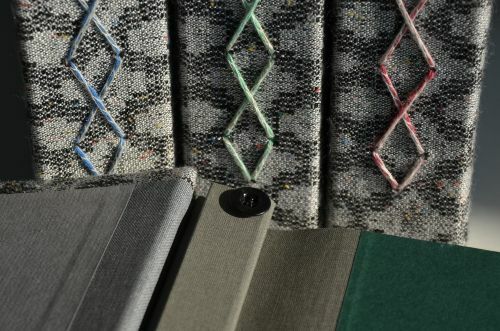 There has been the classic handsewn hardcover as well as experimental bindings and concertinas. It is a total of 18 books I published between 2001 and 2015. Generally, all my books are limited editions, copies are signed and numbered and usally blind embossed. The choice to make this book rather than another for me is a very personal one. Basically, I choose subjects for two main reasons: because they appeal to me as such and for the wider context in which they stand. There will be three posts about the books I have made so far. This first part will be about my books coming with illustrations. In a later post I shall describe the typographic books, and in a separate post the books that have a relation to Britain and the English language. My very first book tells the the story of „Little Niak“. The book itself was published in 2001. However, the story is much older. I wrote it way back in 1986, when my goddaughter still was a little girl. The story was written to be read to her at bedtime. I had just got back from a trip to Sweden in summer 1986. We had been hiking in pretty remote places in Lapland. It was all far off any beaten tracks. In fact, it was far off any sort of track. We had been staying kind of in the middle of nowhere for some weeks. The scenery was stunning, to say the least. There was no kind of shelter apart from the tents we were carrying. It was a very special experience. When I got back there was this story in my head about a chap hiking in remote Lapland, exploring a cave while taking shelter from severe weather. In there he meets Niak and learns that this wee little guy is in charge of our weather. In fact, little Niak is the chef cooking our weather in his very special weather kitchen. So, after having delivered a heavy hail storm to the outside, the two guys sit by the fire, have a cup of tea and chat along about the recipes for snow and hail and the process of preparing the different sorts of weather for the different corners of this earth. The book is a small size landscape format. I made 4 woodcuts showing the landscape of Swedish Lapland. 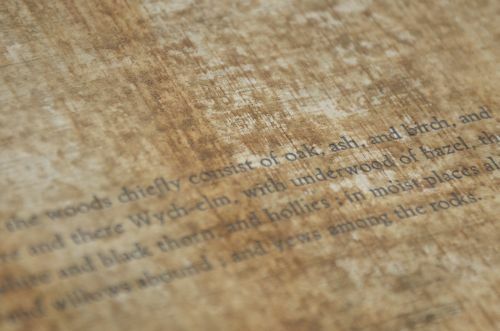 The woodcuts run all along the bottom edge of all pages in the book and they run straight through the fold. The text is hand set from a fount of Baskerville we had cast ourselves on the Monotype machines at a colleague’s. It was an edition of ten copies and has sold out a couple of years ago. 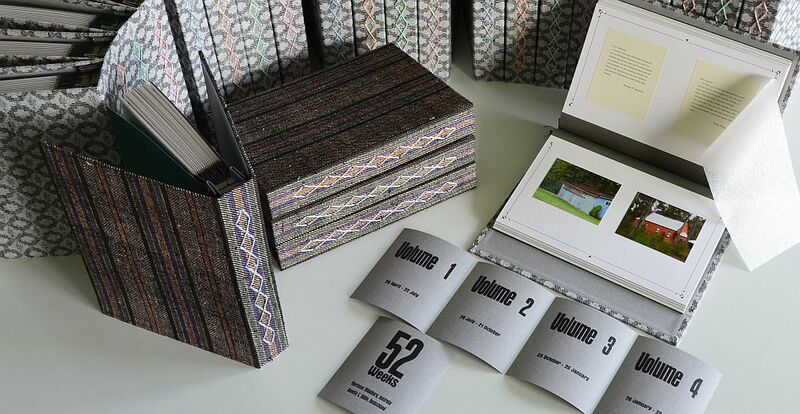 The covers of the special edition have been made from African hand batik fabric. I have a pretty large number of books with fairy tales on my shelves. Many come from my aunt’s, who had been collecting books with fairy tales from all over the world almost all her life and left the books to me. I myself have grown up with the classics not only by the brothers Grimm but also by Anderson, Bechstein, Perrault and others. Then somebody suggested I might make a book about frogs. Instantly I had the idea of re-writing one of the Grimms’ tales. One of their very classics is the tale of the fisherman and his wife. She is described as a voracious character, never satisfied. The book that grew from this idea is „The Frog and His Spouse“. It tells the story of an old frog who goes looking for a wife one last time and gets it all wrong. Being old and short sighted he chooses a warty toad who turns out to be insatiable. 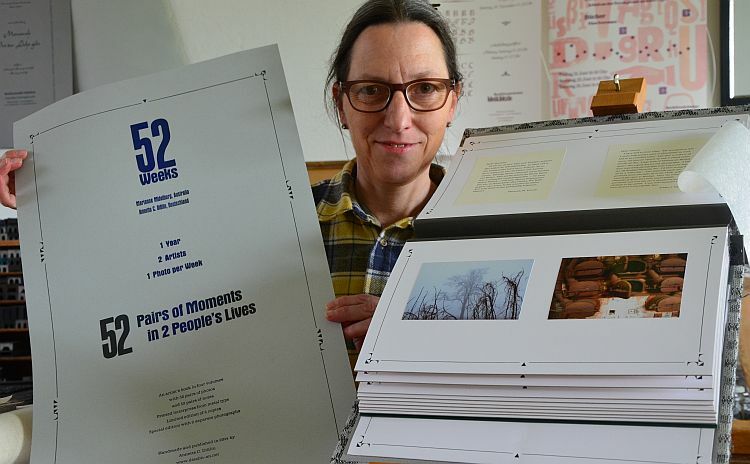 The book is a small portrait format from outside, but landscape format inside and comes with two woodcuts. 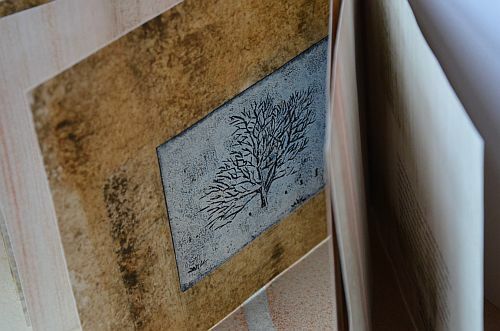 One is inside the book the other one is the cover itself, with the woodcut being printed on a bright green cover cloth. The text is hand set from Akzidenz Grotesk, Memphis is used for the headlines. I chose a paper with a nice decent waterline structure, somewhat resembling the small ripples on the surface of a lake touched by the wind. The book is an edition of 16 and was published in 2003. 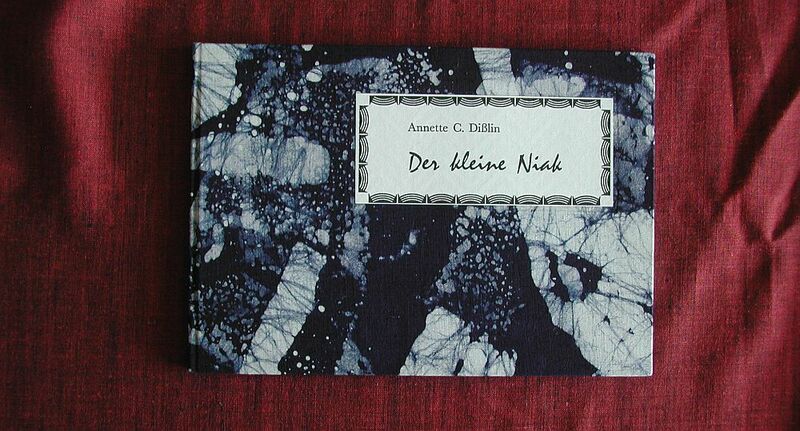 It is one of the last two books I made in the old place at Ebersbach, where I had started as a book artist originally. I moved out there only a few months after the book was finished. Ludwig Bechstein was a 19th century writer and librarian born in Weimar. He is known for collecting fairy tales and legends, his own writings are virtually forgotten. Like the brothers Grimm’s books his works have become classical compilations of long told tales and are part of many family libraries. 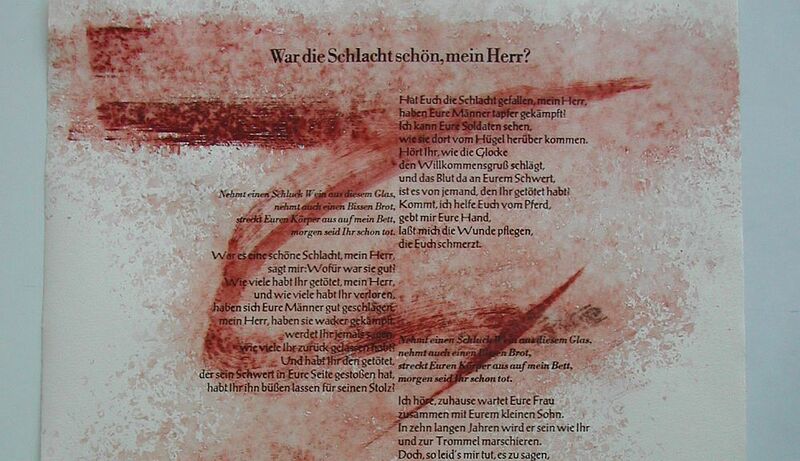 In 2007 I decided to turn one of Bechstein’s tales into an artist’s book. 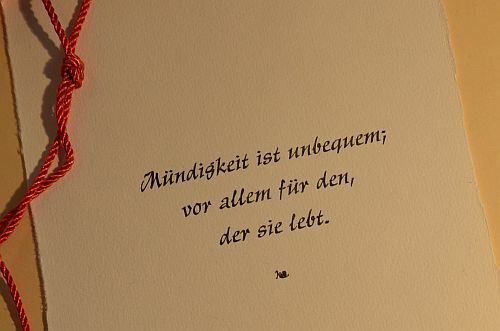 I chose „Das Nusszweiglein“ (The Little Twig from the Nut Tree). The tale tells of a bargain, a curse and a transformation, and it is about confidence and trustfulness – and love. 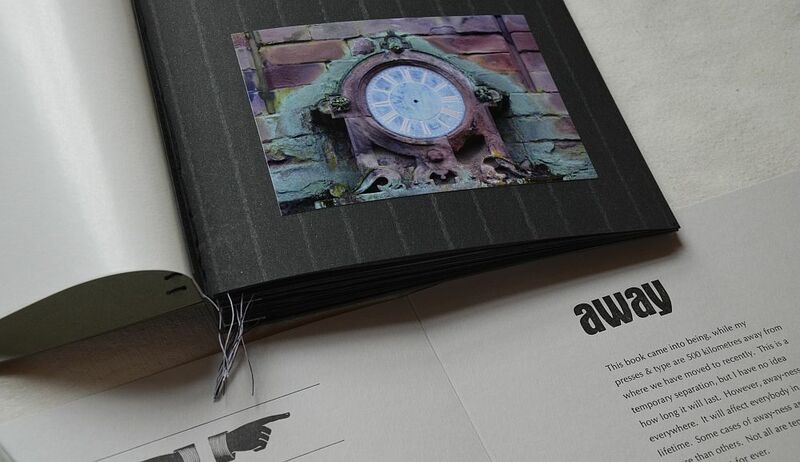 The book is printed on a green-grey deckled edge paper with wavey waterlines. I made five illustrations. They are lino etchings. One of them is a portrait of Ludwig Bechstein going with his biography. 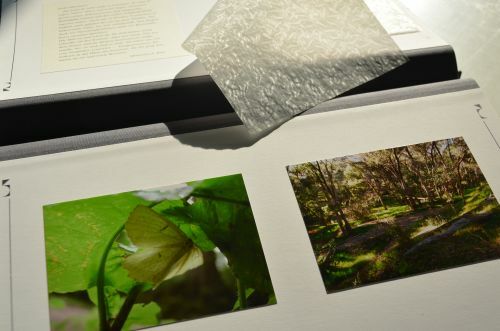 Each book comes with two walnut leaves embedded in silk paper. All text is hand set from a variety of metal type all of the same size of 20 pt. All founts are named in the back in the order of their appearance in the book. Founts used change from page to page. The standard edition is bound in a fabric with bear motif, in the special edition an African batik fabric was used for the cover. All books come in a wooden box. 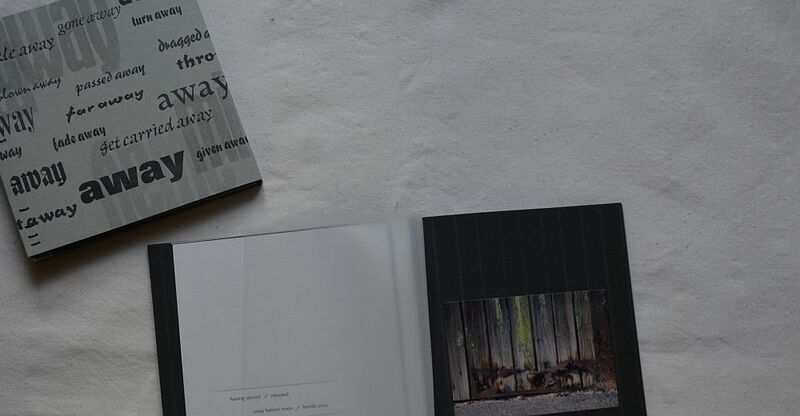 The book is an edition of 12, commemorating the 12 years our wonderful dog had been staying with us. She had passed away in 2006 aged almost 14. In 2009 my studio was 10 years old. The jubilee book was to be a special version of a very old tale. The story itself is very well known in Swabia, the region my studio was located. 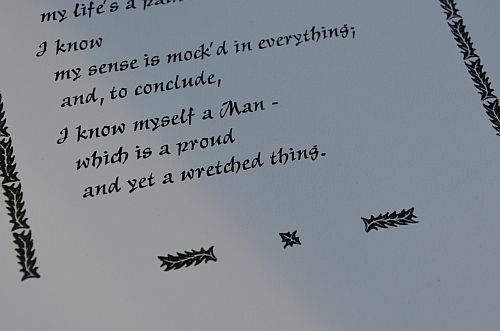 It is part of a book written by Eduard Moerike, a 19th century poet and clergyman. The tale of „Beautiful Lau“ is about a water nymph being expelled by her husband for only having still born children. She has to overcome a curse by laughing five times, one time she is not allowed to become aware of it. A vital part in the tale plays a small piece of lead coming from a wizard and being full of witchcraft. There is a tongue twister about it that makes beautiful Lau laugh. The Swabian term for it is „Kloetzle Blei“ (little nugget of lead), which basically is the name I gave my studio. 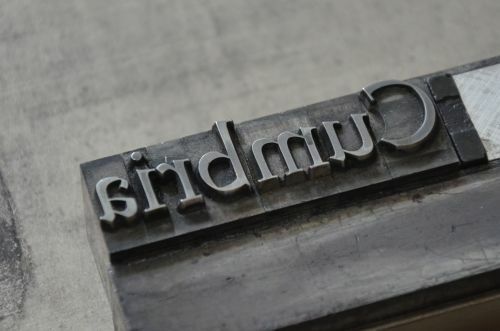 As for my studio it refers to the metal type I use for printing, each character being a little nugget of lead, that can work wonders when used in the right way. I transformed the tale of beautiful Lau into a broadside ballad. The book itself is a concertina folding. The tale adds up to a total of 19 stanzas. It is written to be sung with a very well known tune of an old ballad. During the jubilee event a ballad monger came with her hurdy gurdy and we performed the song in the classic way with me standing on a bench and pointing out with a stick the scenes on the poster broadside that is part of the work. The broadside is a linocut coloured by hand with water colours. The text in the book is printed on strong blue paper and the concertina is made in a way that it kind of pours out of the cover like a well flowing over. 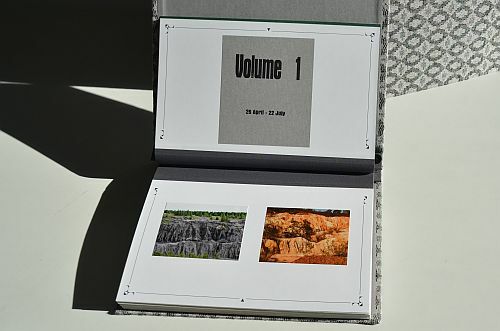 The book is an edition of 16. All books have covers made from blue fabric, but every cover is unique. 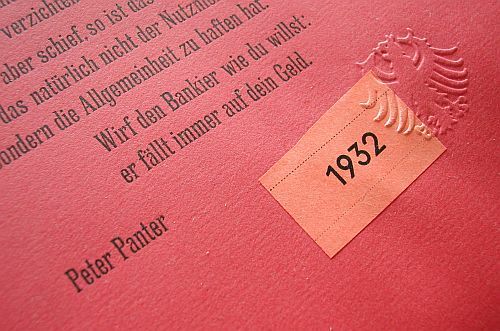 The special edition comes with a portfolio containing the poster broadside, a bamboo pointing stick, the poster announcing the jubilee plus one nugget of metal type with the number of the copy tied to the portfolio. It is up to the owner to find out about the magic powers it might carry. There was a scandal in 2009. It might not have grown into a scandal had it not happend during the silly season. Somebody had bought a pack of rocket and while unpacking it he had found some herb of the wrong sort. He could have chosen to just sort it out and throw it away. But he did not so. He sent it to a laboratory and it was identified as being a poisonous plant, and that was, where the scandal took of. It resulted in a number of very specialised gardeners’ businesses almost going broke as people virtually stopped buying rocket. The herb found has an appaling taste. Normally you would just not eat it. The book inspired by this incident was „Rocket – who has found this?“ and it was published in 2010. It describes 21 plants in text and images that could be mistaken for rocket – well, more or less. The illustrations are linocuts showing the outlines of the leaves. On the bottom of the page describing the respective plants there is a scale showing whether the plant can be eaten or is considered poisenous. There is a sachet pasted to the inside back cover containing dried rocket leaves. The book is sewn through the back with black thread. The book is all about taking responsibility for oneself, for ones own health and life and for the risks one decides to take. It comes with a quote of Immanuel Kant’s quintessential proposition based on the old Latin advice “sapere aude!”. 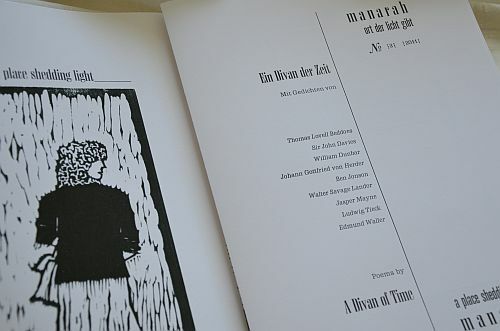 There is a standard edition of 15 copies (Arabic numbers), and a special edition of ten copies (Roman numbers), the latter coming with a poster with all 21 linocuts. Being a trained botanist I thoroughly enjoyed making this book. It is dedicated to our late friend and talented Blues musician Harald Goldhahn who died far too young just before Christmas in 2009, the very time when this book was in the making. So far I have made two more illustrated books. One is „Cumbria“ (Image on top of this post) and the other one „Woods in Winter“ (image below). Both books are completely in English and will be part of an extra blogpost covering those of my works that have a British background. So stay tuned, there is more to come. Moments. Our life is full of them. Infact, you could come to think of our lives being made up of innumerable moments, some of them might be related to each other, others which seem to come and go without any apparent connection. It is as if they can only be perceived by being flashed by a strong light source; to then turn invisible as soon as the light dies away. Centuries ago philosophers wondered whether things only existed as long as they were looked at; ceasing to exist as soon as no-one observed them. We feel that our lives are moving in a line, be it straight ahead or zigzag. Our physical senses constantly perceive sensory input in the form of images, sounds and smells; we are permanently feeling the effects of cold or heat, wind or rain, the texture of our clothing on our skin. This gives us a glimpse of continuity. But our awareness is not static; it also constantly changes. It falters from time to time and from circumstances to circumstance. Our memory can be very selective picking out this and missing out on something else. It is as if we are never told the whole story. Always there remain interstices, little gaps which we may never fill; and so we may never discover what really happened when we were not looking. This line of thinking has always fascinated me when I travel by train, especially train travel at night. I sit in a comfortable carriage, looking out into the dark while the train races past villages and through open landscape, past roads and over bridges. There are houses scattered out there, some windows dark, some brightly lit, an ambulance might rushing somebody to the hospital the blue flashing lights cutting through the darkness. Momentary glimpses of people having dinner or an argument, somebody proposing to a beloved, their neighbours brushing their teeth. None of these people are aware of the others around them. So many lives with interstices, these little gaps are being lived out at the same time, almost in a parallel manner. However, many of these lives progress presumably unnoticed by most of the others. Not being looked at and thus – in the sense of those old-time philosophers – seemingly non-existing. 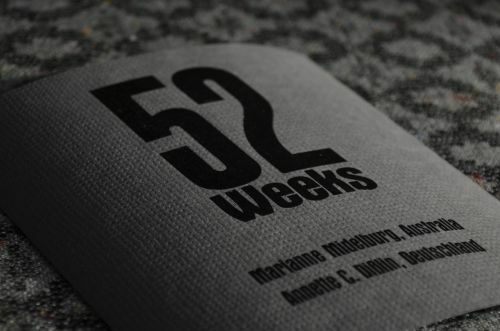 „52 Weeks“ is a photographic project about moments, a book about these gaps, about the many things that often go unnoticed. The original concept idea is as follwos: Two people agree to both take one photo per week over the period of a whole year and write short commentary to accompany each of the images. One of the two artists, Marianne Midelburg, lives in Bendigo, a former gold rush city in Central Victoria, Australia. The other contributor is me and I live in a rural strip of southwest Germany not far from Stuttgart and the Swabian Mountains. 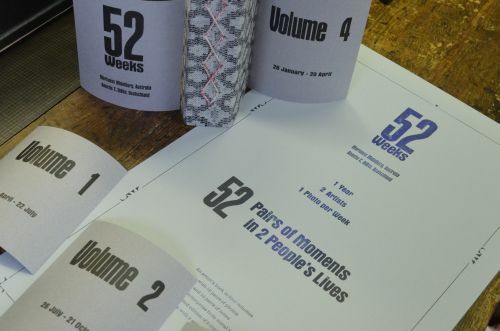 Of course „52 Weeks“ is also a book about two artists: about Marianne Midelburg and me, about where we live, about what we do all year round and especially about the things we look at. We first met in 2007 when Marianne was visiting friends in Germany and having an exhibition with her textile art, her hat creations, her collages and landscape photography. We both had been involved in collaborative artistic projects before, be it on a regional, national or international scale. 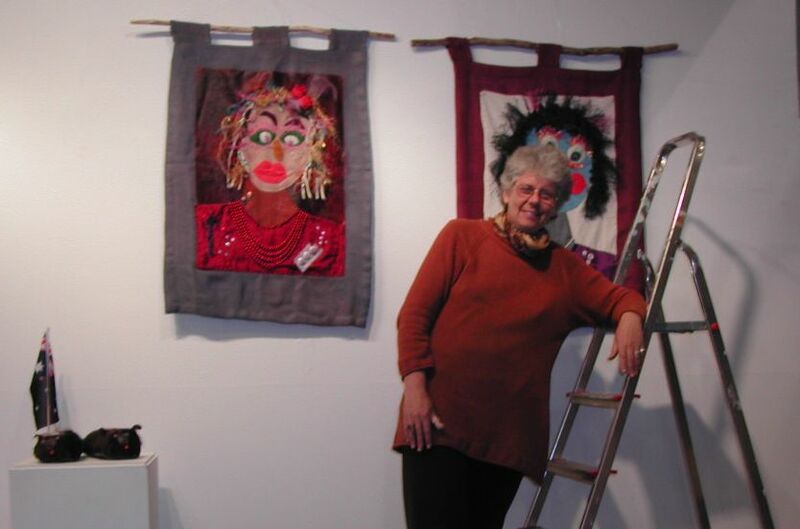 Marianne had participated in several community arts project; one highlight being the Centennary of Federation “… such fertile ground …“project in 2001. 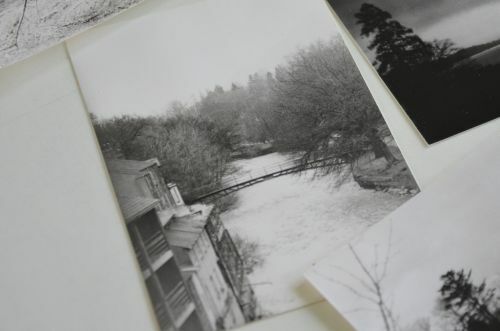 Marianne was one of twelve artists who created large-scale landscape installations across the state of Victoria, the aerial photographs of each work were then made into postcards. In 2006 she was approached by Margaret and Christine Wertheim to become one of the “core reefers” to create the Hyperbolic Coral Reef for the Institute for Figuring, Los Angeles (USA). 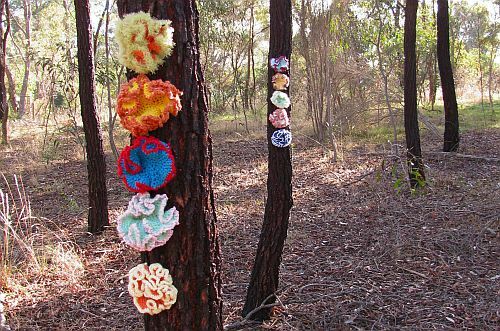 Since then, this crocheted Coral Reef project has extended rapidly to create many satellite reefs and has become a global project to raise awareness for the state of all coral reefs and the effects of global warming. In 2009 I became involved with the worldwide activities of the al-Mutanabbi Street coalition. Their main aim is to commemorate the car bomb attack of March 5th 2007 on al-Mutanabbi Street, the historic literary centre of Baghdad. There are many book stalls and tea houses in this street, it is a centre of culture and communication. With readings and artistic projects in poetry, literature and printmaking the coalition tries to make people aware of how vital and, at the same time, how vulnerable free access to books, information and education still is. As a printmaker artist I have contributet to the Broadside Project and the al-Mutanabbi Street Inventory Project. In 2013 there was a large exhibition of the al-Mutanabbi Street Inventory project at the John Rylands Library in Manchester. 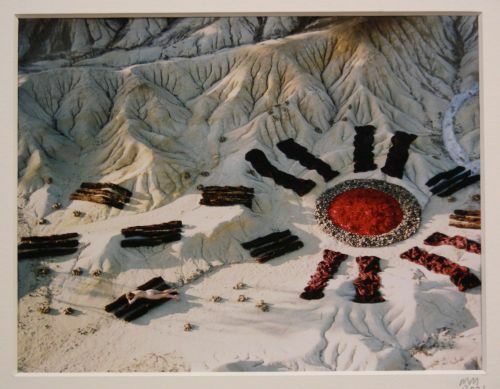 You can find a blogpost in the “Artist’s Books Archive” about this show in that breathtaking location. 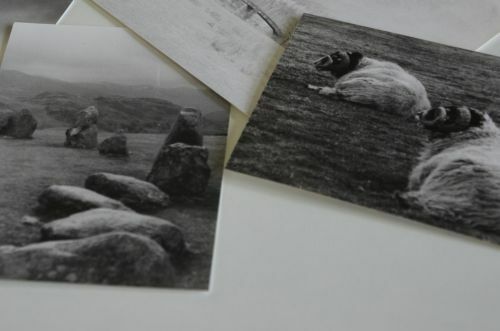 And so finally in April 2011, I decided to begin work on the concept for the book (after Marianne had instantly agreed to join in): one year, two artists, with one photo per week per person resulting in 52 pairs of photographic moments plus a short text. We both wrote our comments using normal every day language, Marianne wrote in English, I dod so in German. 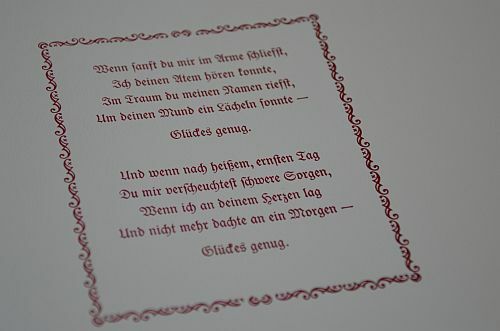 The comments are handset from metal type and printed letterpress; the photos are traditional prints. Naturally the book has an album binding, as this would be what penfriends would do with their collected letters, photos and other memorabilia: glue them into an album. Thus the finished work resembles something like a week-by-week double diary. So, in a nutshell: one year from April 2011 to April 2012 – 52 weekly pairs of moments, one pair following the other in their natural progression, making the gaps in between only the more evident. We will never be able to look at all and everything. There is an abundance of things that’ll go unnoticed by us. However, we can always remind ourselves, that they all exist, whether or not we are looking. 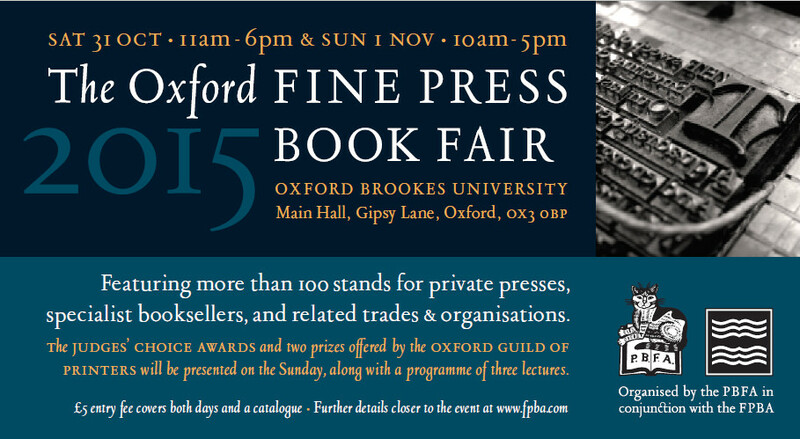 Come and peruse the new book at Turn The Page artists’ book fair in Norwich (UK), 2nd & 3rd May 2014. 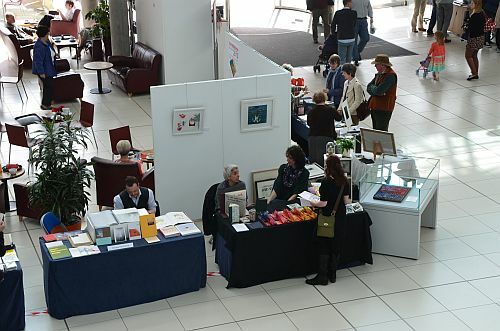 The fair is open 10am to 6pm on both days in the entrance hall of The Forum right in the city centre of Norwich. 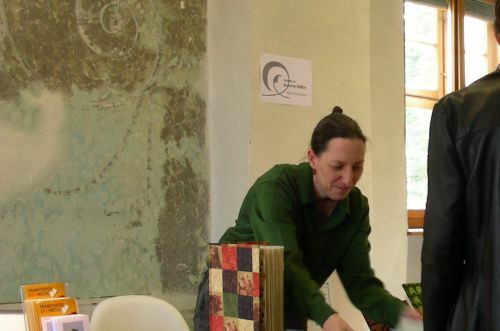 Find a blogpost on last year’s Turn The Page artists’ bookfair in Norwich on this blog in the “Fairs and Markets” archive – klick or scroll down to May 2013. “An ancient British principality, comprising besides part of Cumberland the Scottish districts Galloway, Kyle Carrick, Cunningham, and Strathclyde its capital being Alchuyd or Dunbarton. It was possibly at one time the chief seat of the power of Arthur and in the sixth century was an important and powerful kingdom …The name still survives in “Cumberland”. “The extreme north-western county of England … There is great variety of surface in different parts. 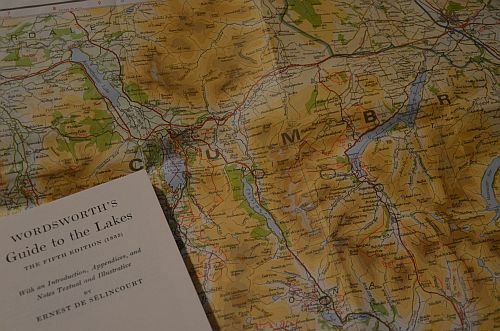 Two ranges of lofty mountains may be traced – one towards the north to which belongs the ridge called Crossfell (2892 feet); and the other to the south-west of which the highest peak is Skiddaw (3053 feet). … The two largest rivers are the Eden and the Derwent. The county embraces part of the “Lake Country” of England. The largest lakes are Derwentwater, Bassenthwait, Loweswater, Crummock, Buttermere, Ennerdale, Wastwater, Thirlmere and part of Ullswater. Cumberland is rich in minerals, including lead, gypsum, zinc, and especially coal and rich hematite iron-ore. In the western division of the county there was a great many blast-furnaces, and works for the manufacture of steel and finished iron. The principal crops raised are oats, barley, wheat and turnips, but the bulk of the enclosed lands is sown in clover and grass. The rearing of cattle and sheep and dairy-farming are engaged in to a considerable extent. Carlisle is the county town, the other principal towns are the seaports Whitehaven, Workington, and Maryport; and the inland towns Penrith, Cockermouth and Keswick. 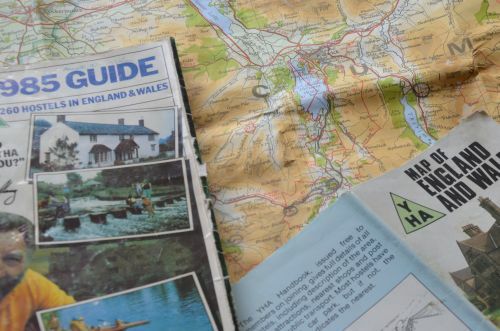 I visited Cumbria back in 1985. It was not spring in the sense that the trees had not yet grown their leaves. There was still a sense of winter as snow was covering the summits of the mountains. It was end of March, I was sleeping in Youth Hostels and some of them were still in winter mode with reduced opening hours. I had decided I wanted to see counties I had not been to so far and since I had only been to Sussex, Essex, Oxfordshire and Berkshire there was a lot more to see than I had time to travel going on what was called a 4-week BritRail ticket. “Former hotel, near centre of busy and popular lakeland resort at the northern end of Derwentwater. On river Greta overlooking Fitzpark. And my diary tells of the murmur of the river running past the walls of the hostel, then swollen from some late winter rain and the melting snow on the mountains. And even though I missed out on noting it down I still remember vividly that they were selling homemade flapjacks in their shop which were absolutely delicious. On one of my last days down in Cornwall I had been visiting Trelissick Gardens and bought a copy of William Wordsworth’s “Guide To The Lakes” in their shop. 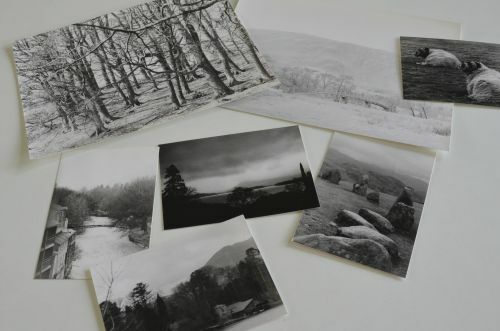 The idea I had in mind when designing my artist’s book “Cumbria” was that it should be like a walk out somewhere not far from Keswick and Derwentwater. 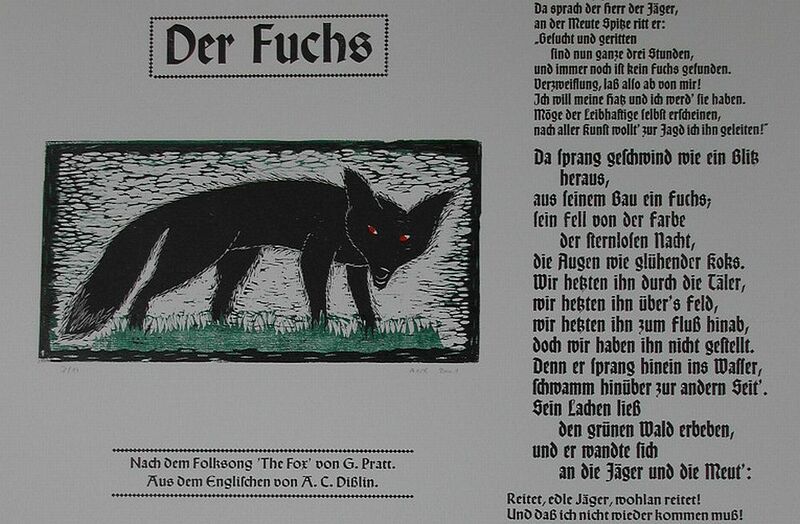 The images are woodcuts showing places I went past when I was walking some of the paths there. The text passages are taken from Wordsworth’s guide, the lines being sprinkeled in between the images like some text passages you might have read years ago will all of a sudden spring to your mind while you walk somewhere in the woods or over meadows taking in the scenery, the sounds and the scents. 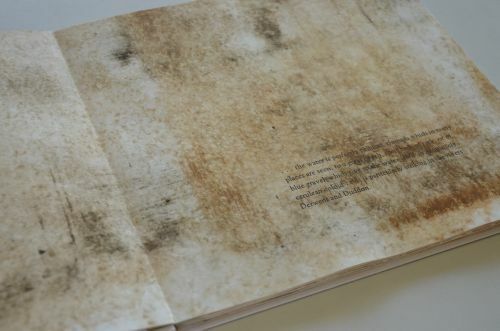 The sheets for the book have been painted prior to printing with specifically made colours using soil pigments. The text is hand set from metal type, the fount used is Trajanus. 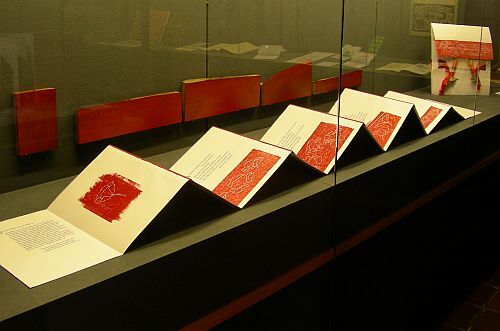 The book covers are made from passepartout board, the woodcuts are rubbed off by hand, the text is printed on a cylinder proofing press (Grafix). The book is an edition of 6 signed and numbered copies, printed in early 2013. Copy No. 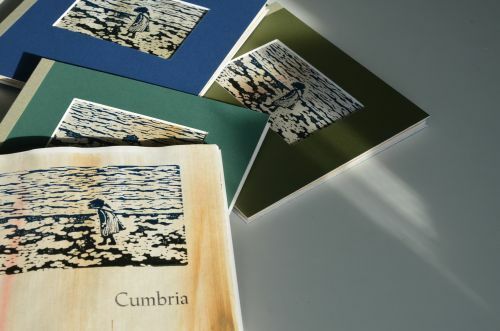 1 is the special edition and it comes with a separate woodcut print by the same title “Cumbria”, copy No. 1 as well. 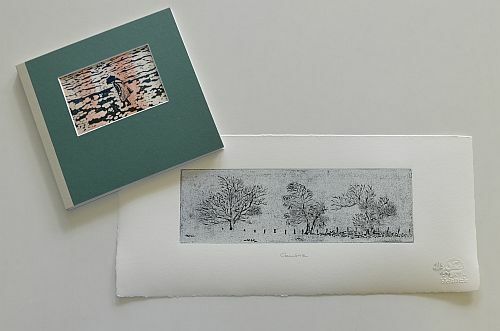 It is, in fact, one of the prints from the book, done separately on deckle-edge paper – in an edition of 6 just like the book – to be framed and hung up to the wall. 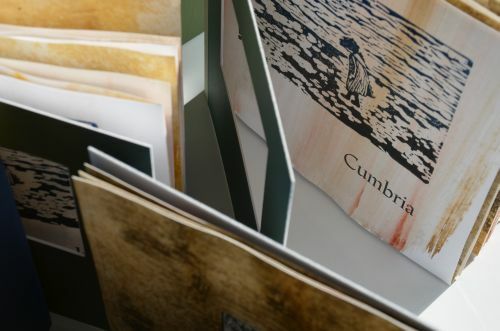 Cumbria – special edition of the artist’s book with print. When I was a student studying in England in the 1980s I heard about Remembrance Day for the first time. I saw all these people wearing their red poppy flowers pinned to their shirts, jackets or coats. And then I wondered whether they seriously wanted to ‘celebrate’ the horrific First World War that England had been involved in. It took me some time to understand that I had got it quite wrong back then. When the horrific killing finally came to an end on the 11th November 1918 it left Flanders devastated. Large parts of the countryside had been ploughed over by the massive bombing and the dismembered bodies of thousands of soldiers had gotten mixed with the soil in a way they could not be brought home or even buried in the proper respectful manner. Within days the countryside had turned into a sea of red: millions of red poppies covered these fields of grief and horror. Red poppies are summer flowers; they don’t usually come to bloom in November. On the other hand, a botanist would be able to give a quite unspectacular explanation as to what happened then and why. However, there’s a bit more behind this. For a very long time the Red Poppy has been seen as a symbol for both Death and Life. People in all their grief, pain and despair, could see the message pinned to the coat or jacket and understand. The still unknown total death toll of WW1 demanded action to be taken for Life and for the living. The Red Poppy became the symbol for Remembrance Day, a day to remember not only all those, who had fought and died, but also those individuals that had survived wounded; who had lost a limb or their sight. The Red Poppy is also a symbol for the families who had lost a father, a brother or a son, and for the many young women who had lost their husbands, many of whom had only been married weeks or months earlier. The Red Poppy reminds us of the tragedies any war can bring. This simple red flower is a warning to always be aware and be prepared to take appropriate and timely action against looming conflicts. 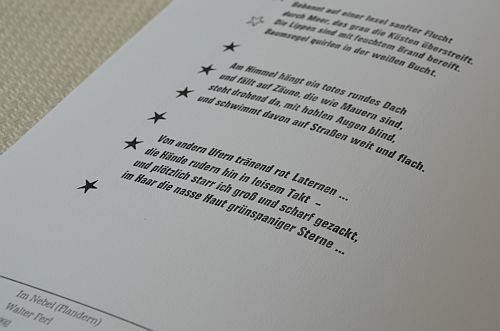 In 2006 I asked Scottish-Australian folksinger and songwriter Eric Bogle if he would give me the permission to translate his song ‘No Man’s Land’ into German in order to make an artist’s book. He immediately gave me permission. I loved his lyrics and very much enjoyed translating them into German. 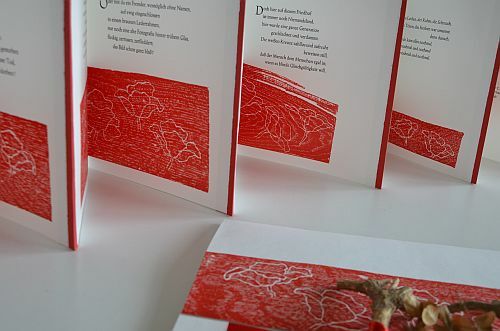 Then I made 5 woodcuts of Red Poppy flowers dancing in the wind over Flanders. 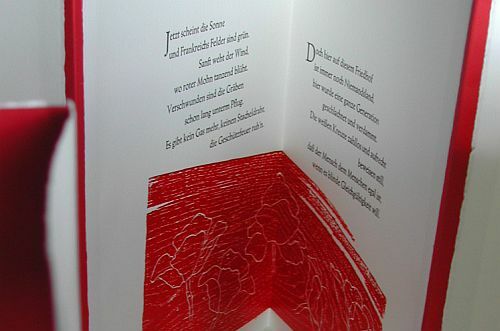 The finished result is a concertina-folding type book; the sheets of the deckle-edge paper are connected with poppy-red folds. 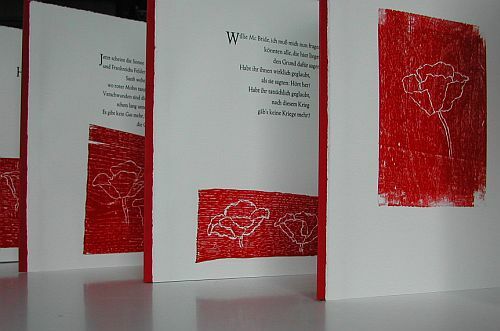 The woodcuts are rubbed off by hand and printed poppy-red. I used blocks of oak wood that had cracks and an interesting wood grain, giving a most pleasing texture. The song text is set by hand from a very old and much used metal type: Trajanus. 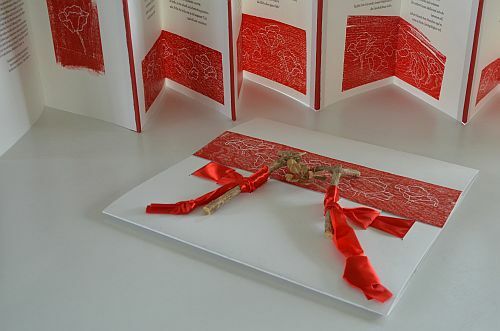 The book is housed in a portfolio with a clasp made of poppy-red ribbon and Boxwood twigs. Boxwood was very commonly used as a border of graves, symbolizing eternal Life, everlasting true Love and the overcoming of Death. The edition is signed and numbered and limited to 11 copies relating to the particular date and time of the 11th November at 11 o’clock in the morning when the guns finally fell silent. including a link to Eric Bogle’s original lyrics and a reference for further reading. Manarah is an old Arabic word for ‘lighthouse’, a place of light to help those on a voyage find their way. Later the word developed into ‘minaret’ – which is the tower of a mosque. I found out about this a few years ago whilst doing research on this topic. The Swiss populace had just voted not to allow the building of minarets in their country. I like the image. A lighthouse gives guidance and orientation but it does not take you by the hand. The symbol of the lighthouse does not make it too easy for you. You’ve still got to do the travelling by yourself. You’re still responsible. You are free to make your own choices. 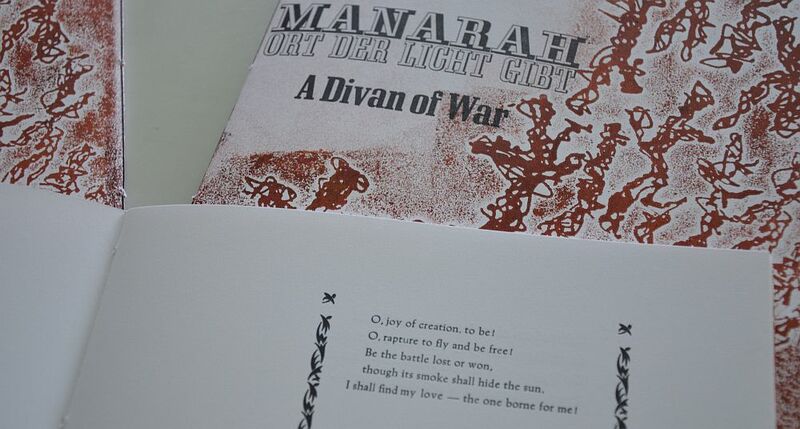 My ‘Manarah’ is a book-arts magazine printed letterpress using metal type. The first 3 issues were published in 2011. 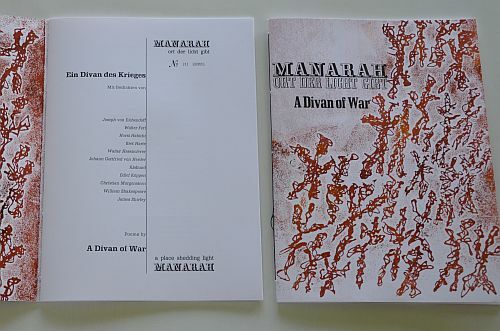 Every issue is a ‘Divan’, a collection of poetry on a chosen subject. ‘Divan’ is a Persian word for the collection of poems. I had decided that these first 3 issues would be my contribution to the al-Mutanabbi Street inventory project. 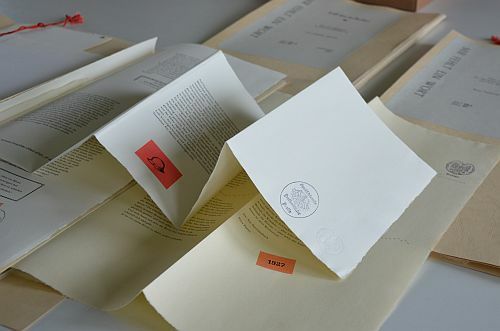 This project is one response to the bombing of al-Mutanabbi Street in Baghdad back in March 2009. During the attack the centuries old city district of bookselling as well as literary and intellectual life was totally destroyed. One hundred and thirty lives were lost or injured. An ancient city’s cultural heritage was left shattered. 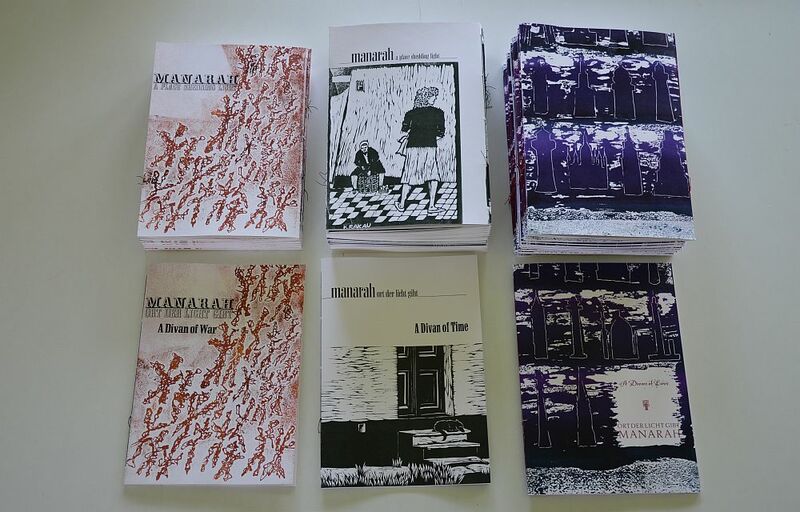 Beau Beausoleil, a Californian writer and bookseller with his al-Mutanabbi Street coalition, has put out the global call to follow the “al-Mutanabbi Street Starts Here” campaign. 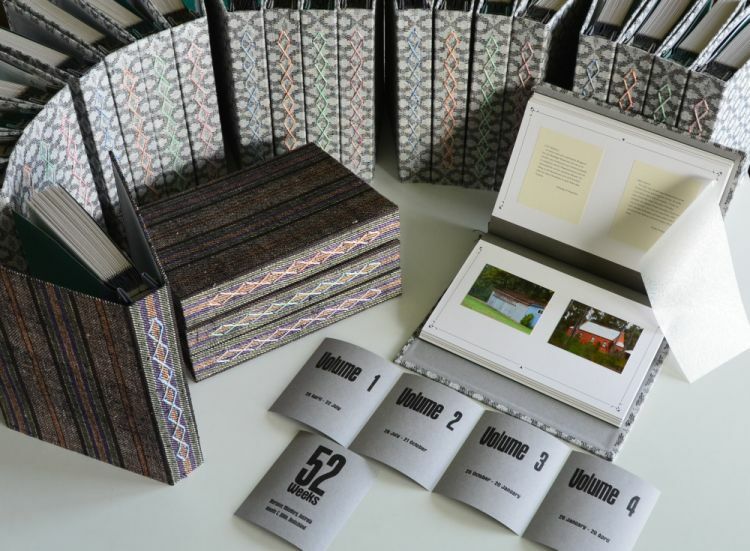 They asked bookartists all over the world to follow their call and built up a new inventory of books for al-Mutanabbi Street by making 3 works of bookart each. The 3 themes I choose for my three issues were: war, time and love. I felt it would need love and take time to overcome the destruction and suffering caused by war. From the time when I realized that there was something the adults called ‘News’, this News was usually about war and death. During my childhood and teenage years there were wars and conflicts in Belfast, Lebanon and the Near East and in the Basque country of northwest Spain. Of course there were other wars and conflicts elsewhere, but these were the theatres of war I remember during my formative years. Some of these wars went on for decades; many of them are still no closer to a peaceful resolution. Thousands of children, born in these places, die during a bombing raid or get caught in sniper fire. If they survive they lead a life of permanent threat, danger and hatred. They could lose any of their family or friends at any moment. It becomes almost impossible to lead a normal life, have a proper education, earn a decent wage, build up a career, raise a family or even build a small house. How can one lead a normal life, when everything can be taken away from you at any moment? I feel the deepest respect for any person who grew up during a war or a regional conflict and who will stand up for peace. Someone, who will still make every effort to stand strongly against hatred and against the lies and distortions of the truth of war; someone who is convinced that war will never give an answer nor be a solution – and who has the courage to say so. 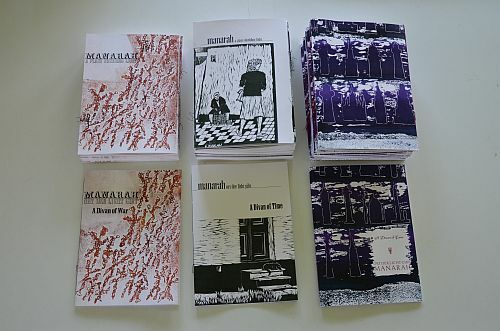 The choice of poems in all my Manarah issues covers a period of four centuries going back to the 16th century with William Dunbar being the eldest of the chosen writers. I also feature a number of poets who died during WWI. These poems tell of despair and hope, of pain and solace. They raise questions and seek answers that have been troubling mankind ever since he gained self-awareness. The collection of poems tells of the deeply felt longing for a life lived in peace and within a community full of loving understanding. They express the wish for tolerance and the possibility for one and all, to gain a state of inner contentment and happiness. These have been the treasures of mankind – and so they should remain for all times. 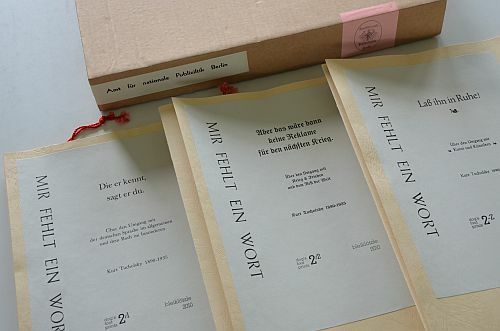 Poems have been chosen from English and German sources and they have been printed all in their original wording with no translations provided. Covers are either woodcuts or linoprints. 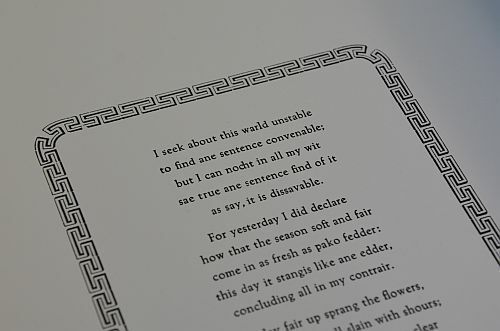 All poems have been set by hand from individually chosen metal type and ornaments. Every issue is a limited edition, numbered and signed, with less than 25 copies each. The issue on War has ten poems, the issue on Time has nine and the issue on Love has thirteen poems. 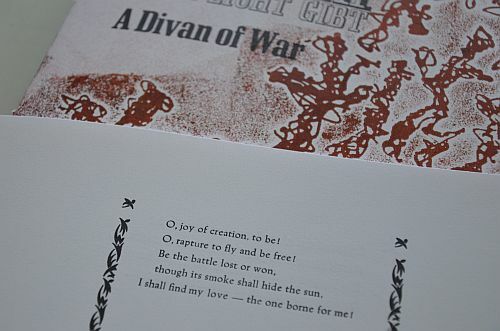 This edition on Love also comes with a linoprint portrait of Joseph von Eichendorff, one of the poets. Copies are hand sewn with black or red thread. When the Nazis came to total power in August 1933 they established an initial list of people to be expatriated from Germany. One name on that list was Kurt Tucholsky. He was then aged 43 and had become a well-known author, reputable essayist and journalist during the Weimar Republic. He wrote for the newspapers “Weltbühne” and “Vossische Zeitung”. He had studied law and as a soldier during WW1, he felt an intense dislike for the Nazis for numerous reasons; one of which was his own fear that the Nazis would plunge Germany into another brutal war in the very near future. Tucholsky was a great lover of the German language and a brilliant writer. He was witty, humorous and could be bitterly sarcastic when he honed in on particular issues. He very much enjoyed playing with pseudonyms and used five of them simultaneously, treating each of them as a quasi-personality in its own right. Apart from his real name, there were also Peter Panter, Ignaz Wrobel, Theobald Tiger and Kaspar Hauser. He stopped writing completely when he was expatriated and tragically took his life aged 45, exiled in Sweden in 1935. I have loved his skilful way of handling the German language ever since I first read his work back in the 1980s. I respect him greatly for the clarity of his insight. Much of what he wrote during the Weimar Republic still holds true today. This is a frightening thought when associated, for example with the control industry held over politics, with the international trade of weapons and with Germany’s jurisdiction back in the 1930s tending to have a ‘to the right leaning’ blinkered vision. Tucholsky was able to provide evidence of the severe nature of forced imprisonment and unlawful sentencing against Socialist or Communist ‘rabble’ when compared with the much less severe conditions of detention inflicted on Conservative or Fascist ‘villains’. “Mir fehlt ein Wort” (I lack the word) is how Kurt Tucholsky expressed himself when he did not know the right word to appropriately describe what the leaves of the Birch tree do when touched by a breeze. This sentence has become the title of an artist’s book I made as an homage to Kurt Tucholsky. 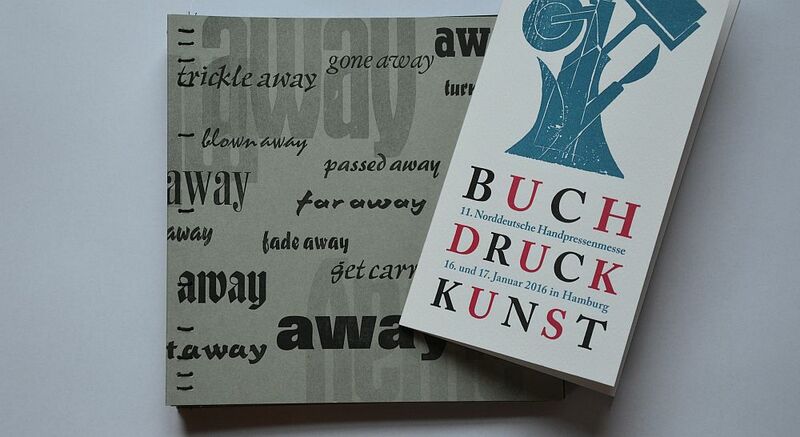 The book was produced in 2010 for the 75th anniversary of Tucholsky’s tragic death. 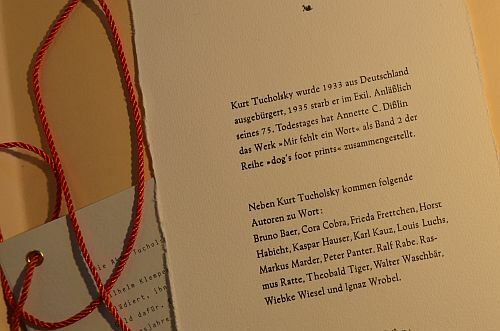 This work comprises 3 portfolios – one on Language, one on War and one on the Arts, giving a total of more than 60 texts primarily by Kurt Tucholsky. 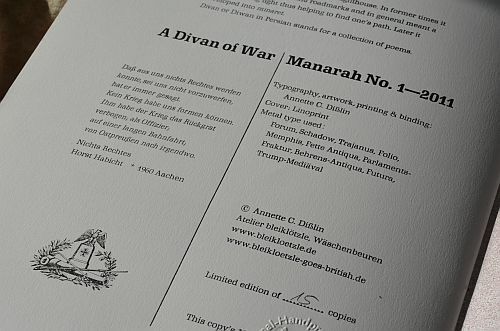 The folios are printed letterpress from metal type throughout. The work comes in a corrugated cardboard box resembling an archive box and the portfolios are presented as if they are Secret Service files. I worked out the story about a young printer, who started working in a Berlin printing office during Weimar Republic. When he came across a text he liked, he would take one of the spoils home to read and then he’d keep it. 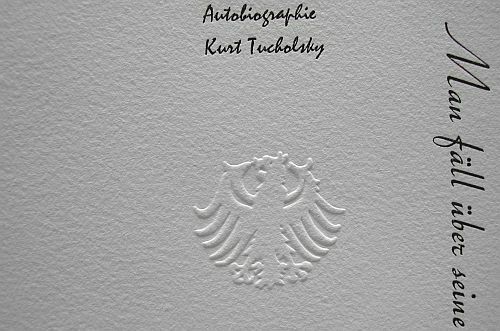 Over the years he accumulated a fine collection of mainly Kurt Tucholsky’s writing. This young printer with his young Jewish wife left Nazi-Germany in early 1933 and the collection of spoils ended up in the hands of the Nazi officials. 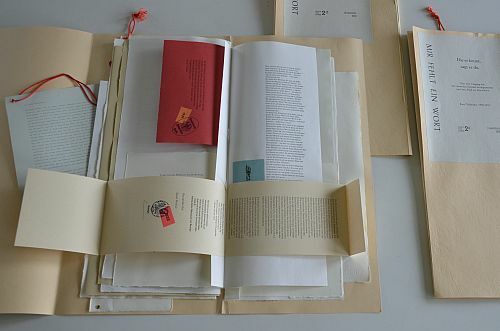 These literary works were then turned into processed files to prove that Kurt Tucholsky was a “Vaterlandsverräter” i.e. a national traitor. This was reason enough to force him into exile. I too play the game Tucholsky loved so much. I incorporated some more pseudonyms, featuring authors like Cora Cobra or Louis Luchs and their essays on recent topics, in ways Kurt Tucholsky might have done if he were still with us today. The files are assembled from a wide variety of papers and sewn in the original Prussian style in similar fashion to the official files used in Prussia and housed in the state archives. 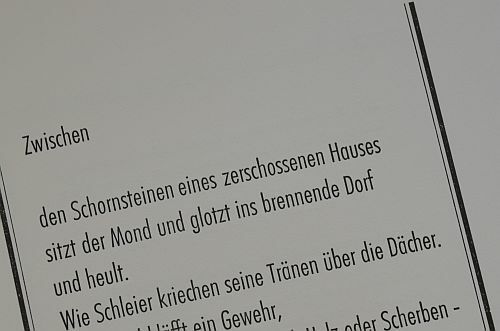 The texts are in German. The work is a limited edition of 12. Numbers 1 to 6 are special editions with all three files contained in the one box. Numbers 7 to 12 are the normal editions with File No.1: Language and File No. 2: War having their own boxes. Special rubber stamps and embossing tools have been designed and made to mark pages in an official style. 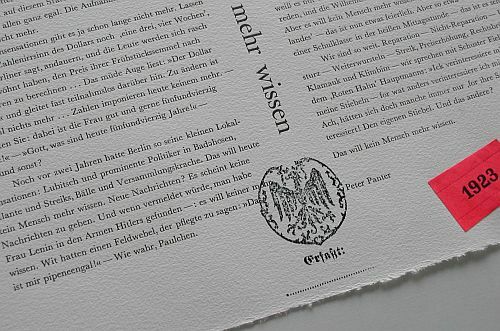 Stickers have been printed letterpress giving the year when the texts were originally written. 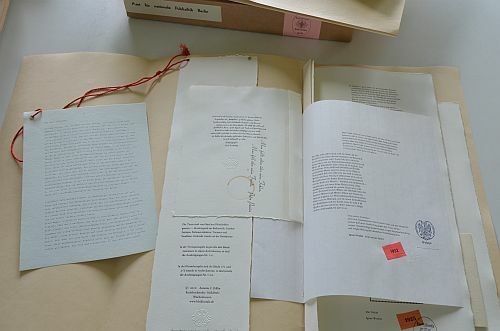 The story of the young printer is a typewritten script on very old blue fine typing paper and tied to the cover with piece of thick red string.